These glasses may not be made from wine bottles, but they follow the same concept. 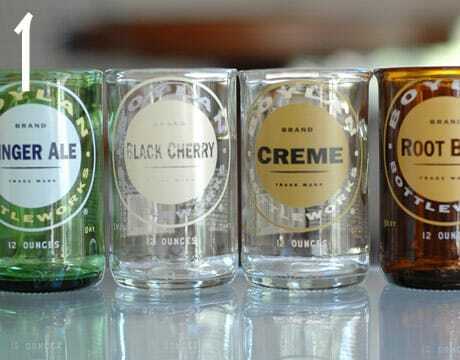 Simply use the wine bottle cutting technique for making these soda bottle glasses! 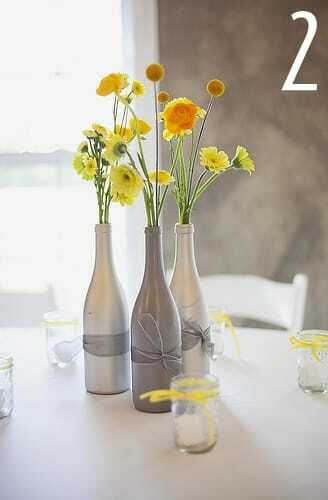 Simple & elegant wine bottle vases. Use metallic spray paint on wine bottles to achieve this look! 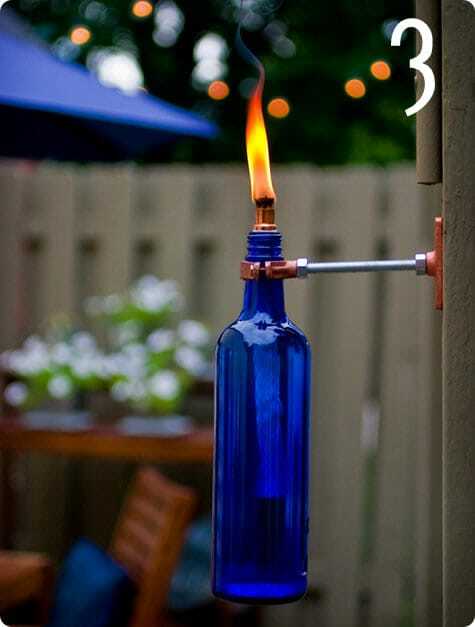 This is really amazing, I just love the rustic feel of this up-cycled wine bottle torch, get the DIY on Design Sponge! 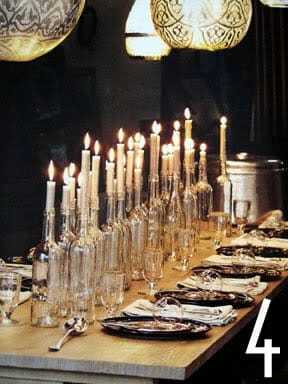 Create a mind blowing table scape by inserting candles in clear wine bottles like I do it yourself did! 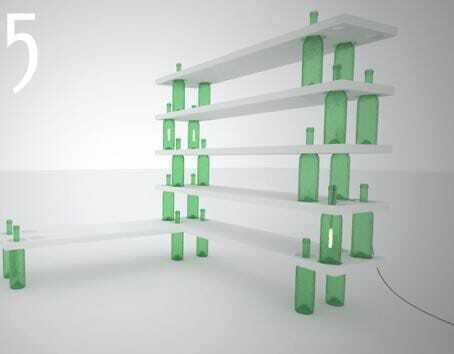 First Step Designs has created this incredible hanging lantern by cutting the bottom off wine bottles. Amazing. 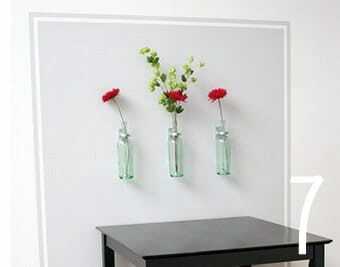 Create wall mounted wine bottle vases by securing wine bottles to the wall using standard plumbing brackets you would find at your local hardware store! 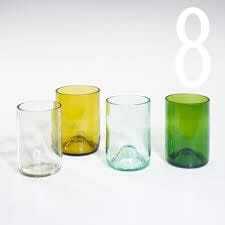 Here are the real “wine bottle glasses”, similar to the soda bottle glasses above just much larger! Again, use my how to cut a wine bottle technique for these! 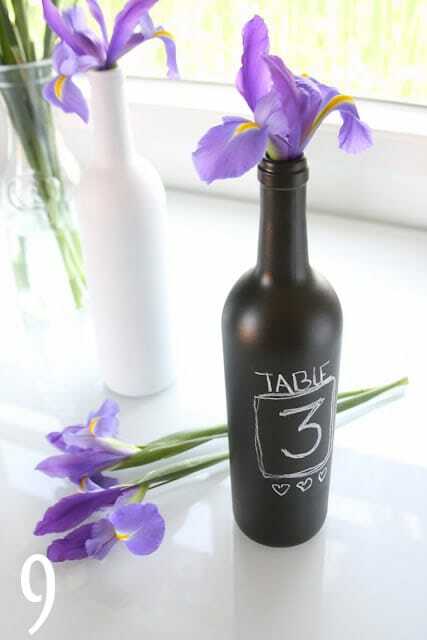 This idea is genius…paint wine bottles in chalk paint and they can be used for just about anything! 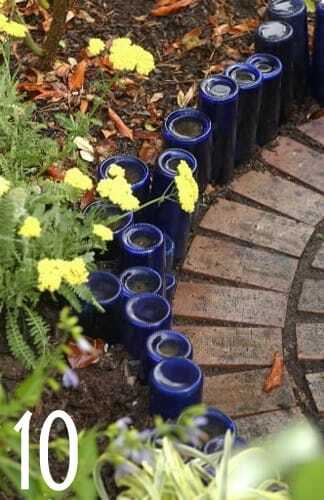 This wine bottle walk way is such a cool, eclectic look! 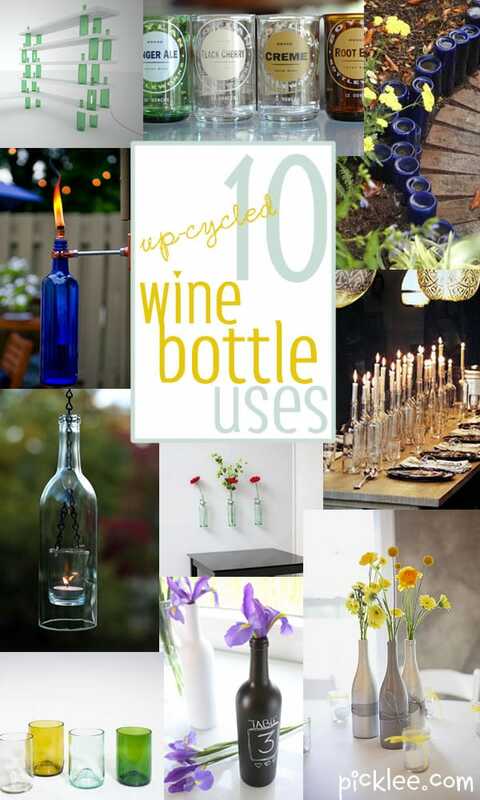 What a great way to put funky blue wine bottles to use! Hi! This is an amazing technique! Thank you for the tutorial! Imwasmwondering, when you make the wine bottle glasses, do you need to sand the opening after cutting it?! It must be sharp no?! And if I have, lets say, beer bottles with a paper sticksr that I would like to keep, how can I keep it clean?? Could I mudpodge hit or something? Thank you!! Yes, you would want to use sandpaper to smooth out sharp edges for glasses, they are a bit more difficult…To preserve the stickers I would definitely use something like mod podge, dice it will protect them and go on clear. Emery boards(like what is used for Ladies’ fingernails) work wonders for things like this! you can get into small areas with emery boards where you may not be able to with sandpaper…sometimes you have more control too. Can you tell me what mod podge is? I’m in New Zealand and have never heard of it,although I often see it mentioned on craft sites. Mod podge is a brand of paper-mache glue, the brand name has become generic. Problem is, it is not waterproof, so it would not necessarily protect the labels from water and spills, though it would keep the label from peeling off too quickly. If you use the outdoor mod podge I believe it is waterproof. Or at the very least a little more weather resistant than the regular kinds. Pingback: Cuando la botella tiene una segunda vida. 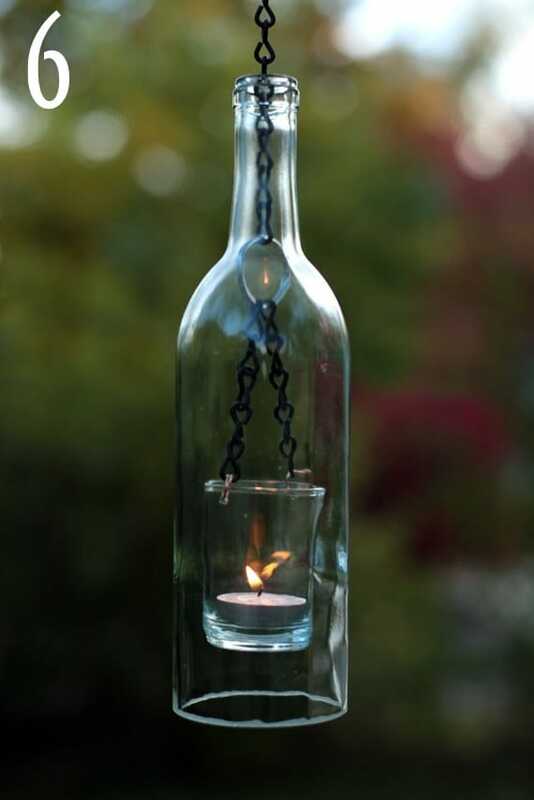 I love the hanging wine bottle votive, where can I get the chained votive. I would really like to make this. I made a set for my boss’s wife for Christmas. My husband drilled a hole on each side of the votive holder. We put a clasp through each hole to hold the votive to the chain. I purchased my chain at Walmart in the jewelry crafting section. Hi! What a beautiful site! I love your ideas. I actually have a bottle cutter that was inexpensive and works great too. But, I was curious how you got the soda bottle tops in photo #1 so beautiful? I’ve tried sand paper, but it doesn’t really look so nice. Thanks! Where did you find the bottle cutter been looking for one? How do you get the lables off the wine bottles? I have a sticky mess left after soak them off. Beth, have you tried using white vinegar? goo gone,,,,,most hardware or home imporvement stores. to get the labels off of wine bottles, or any other kind of container, be it glass, plastic, metal,etc…. #1) scrape off as much as you can with a utility knife(PLEASE, wear gloves to protect your hands from cuts, & safety glasses to protect your eyes). #2)using a cotton ball(or several if needs be) and rubbing alcohol, rub down the entire area where the label was. I don’t know the science of it, but rubbing alcohol will remove the adhesives used for labels. Please keep in mind that if the label was painted on the container, rubbing alcohol will NOT work. If you pour hot water in to the bottle and let it sit for a while for the bottle and the glue to warm up and it should peel of pretty easy if not leave a little longer. Once peeled empty the bottle if glue is still there use a small cotton ball with acetone nail varnish remover. it will clean up in very little time. I have used the hot water method. It works great. Use a funnel and pour slowly or the water will sort of backfire on you. Only takes a few minutes for the glue to soften enough to peel the label off. How do you put the wine bottles in the ground without breaking them? Not one mention of making your own wine, and refilling the bottles. (If you’ve emptied them, you’ve no problem with drinking) or home made syrups or tinctures.